I spent a day with a group of leaders last week, and one of our topics in management was walking around. Each person was given an assignment to go do it daily for a week and journal about it. Only a third of the class did it, but those who did had some great stories of what they heard and observed. The rest missed an opportunity. If you believe in people-centered leadership and the basic belief that people work harder when they feel cared for/listened to (and when they care about/listen to the people around them), then showing up is what you do – always. Do any of these statements reflect your commitment to show up? Showing up always starts as a physical presence. When it is done well, at some point it moves to a more emotional presence. This is where agape love kicks in. What is agape love? 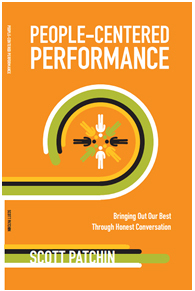 Read about it in People-Centered Performance. I lost my father a couple of weeks ago after 90 years of life. As I thought about what I admired about him as a father, the top on the list was he showed up. Once I was challenged by a coach that showing up was not enough. I believe he was wrong, because when we show up consistently relationships are changed. When I look around at broken friendships, failed leaders, dysfunctional teams, and lonely people – it always seemed to start when someone stopped showing up. I hope somebody writes the same thing about me someday. What about you? Why don’t you try management by walking around for a week or so. Be part of the 33% that get it. When you are ready – why don’t you try parenting by walking around and marriage by walking around?